Also know by proprietary names such as DHI, FIT, CIT, FUSE, WOODS METHOD, and DHT). In this method; the hair Roots (Follicular Units) are individually harvested one by one from the donor area by a micro punch device of 0.75 to 1 mm size. The wounds are tiny & heal rapidly with no visible scar or pain. Recent advances have evolved this modern and stitch less method that eliminates the potential side effects occasionally seen in the conventional Strip Procedure because of the stitches in the donor area. This new method does not leave a linear scar on the back of the head and the wounds are tiny, there is less blood loss and heals faster compared to the strip method. The procedure is practically pain free post operatively. Allows short hairstyle or buzz cut without showing up any linear scar. Final outcome is better. We use 0.75 to 1 mm micro punch with depth control and use the safest Lorenzo technique for extraction Unlike Strip method FUE does not expand the balding area due to stretch of the skin while stitching up the wound. It is better for the extraction of white hairs. It is ideal for tight scalp due to past surgery or fibrous skin where strip surgery can have donor area problems. FUE grafts are usually less bulky compared to strip grafts and therefore they require smaller size incisions for plantation and therefore less trauma is inflicted and more density can be packed. Because of the nature of the procedure it is more expensive compared to strip procedure. For over 400 to 500 grafts usually you need to shave the entire donor area, which at times is a limitation for some people. Why FUE is better than FUT ? 2. FUE heals faster because of its minimally invasive nature usually in 5-7 days the wounds are healed. 5. Better quality grafts esp. for white hair compared to Strip method this is because there in strip method to separate the white hair from the white dermal tissue is practically very difficult if not impossible and therefore there is more transaction rate. 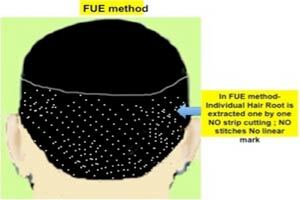 there are many more advantages of FUE method over FUT. Since the wold is in the transitional phase from FUT to FUE and FUE is more technically demanding, there are many older doctors who are resistant in switching to this new technology minimally invasive method which is certainly going to be method of future. In last 3 years world over there is big swing from patients and doctors side to FUE method from FUT. Well usually FUE needs shaving of the donor area. Because some people do not want to shave their head they cannot take regular FUE. But we have modified our techniques where we can now offer FUE even without shaving the entire donor area. This is a variant of FUE. This will not make it obvious to others that you have undergone such a procedure. This procedure is much more demanding and will take longer time to perform. We can harvest up to 1000 to 1200 grafts by this method. This procedure therefore costs more than the regular FUE procedure.